Whether you have 100 or 10,000 PDF files you want to extract text from, VeryPDF Table Extractor OCR's smart filters, and fixed & variable location extraction options will get your there. PDF's are a very popular file format, BUT, that doesn't mean that converting PDF to CSV and extracting text data from PDF files has always been a clear and easy mission. Until now. VeryPDF Table Extractor OCR is best utilized when you have a recurring volume of PDF files, (purchase orders, invoices, expense reports, etc.). We take the repetitive work out of extracting text data from PDF files manually, while increasing the accuracy & offering integration options as well. 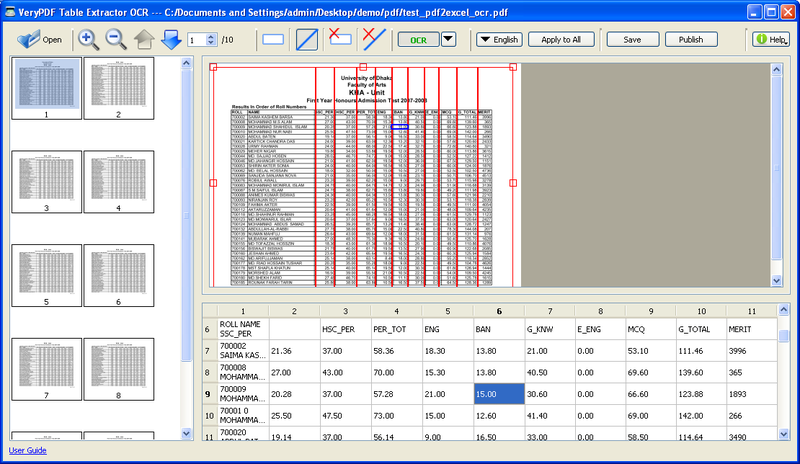 VeryPDF Table Extractor OCR has smart filters that can seek out key information (Name, Date, Order Items, Phone Number, etc. ), or location based filters that you can chain together to get precisely the information you want when converting PDF to CSV. Once you have your parsing needs or “rules” defined, you simply batch upload PDF's to your account, or you can email recurring PDF files as attachments, and automate your workflow. *Note you can also turn the extracted PDF text to Excel. Have PDF's in multiple physical layouts? Purchase orders, invoices, even expense reports, are a snap with VeryPDF Table Extractor OCR. Simply set up your layout parsers accordingly, and you can still batch convert pdf to csv with little effort. Our Getting Started article covers the basics to get you up and rolling and our Support can aide you along the way, if needed. A screen shot of parsing rules is shown below, you can add as many as you need to extract text from PDF files and convert PDF to CSV. How to extract text in columns from a .pdf? Extract Text Based on Columns & Multi-layer PDF File. This entry was posted in Table Extractor OCR and tagged pdf to table, pdf to tabular. Bookmark the permalink.